For one day, keep a log in which you describe your communication activities. Keep track of the time and different ways you spend communicating, such as talking person-to-person, listening to your teachers or the radio, watching television, reading books, and other print media, and communicating online. Discuss with your counselor what your log reveals about the importance of communication in your life. Think of ways to improve your communications skills. In a small-group setting, meet with other scouts or with friends. Have them share personal stories about significant events in their lives that affected them in some way. Take note of how each scout participates in the group discussion and how effective each one is in telling his story. Report what you have learned to your counselor about the differences you observed in effective communication. List as many ways as you can think of to communicate with others (face-to-face, by telephone, letter, e-mail, fax). For each type of communication discuss with your counselor an instance when that method might not be appropriate or effective. Create a web page for your scout troop, school, or other organization. Include at least one article and one photograph or illustration, and one link to some other web page that would be helpful to someone who visits the web page you have created. It is not necessary to post your web page to the internet, but if you decide to do so, you must first share it with your parents and counselor and get their permission. Plan a troop court of honor or campfire program. Have the patrol leaders' council approve it, then write the script and prepare the program. Serve as master of ceremonies. 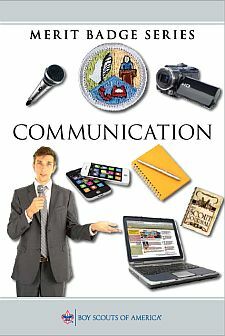 Learn about opportunities in the field of communication. Choose one career in which you are interested and discuss with your counselor the major responsibilities of that position and the qualifications, education, and preparation it requires.